1. Christina Von Eerie (@CVEvil_138)-We wanted new blood and boy did we ever get it! Over the weekend, we saw some very good performances, but no one that really DOMINATED a weekend enough to be considered a clear cut #1…except for this talented lady. She answered the question as to whether we need separate rankings for women by becoming the first ever woman to be ranked #1 after winning the QPW Women’s Tournament on 9/13. It was a hell of a victory for a hell of a talent. Regardless of gender, she absolutely earned her #1 ranking this week with wins over Kahmora, Heidi Lovelace, and Joey Ryan on 9/14. Congrats to her! #6 in the online poll. 2. Drew Galloway (@TheDrewMcIntyre)-The EVOLVE Champion has been bouncing around the Top 10 a bit without a very high ranking of note, but that all changed after the weekend he just had. First, he defeated Rich Swann to retain the title on 9/13 and then he defeated Roderick Strong in a non-title match (that he requested to be a title match to no avail) on 9/14. He’s obviously a fighting champion and this will continue to help his rankings in the future. More good things are obviously on the horizon for this WWE superstar.#7 in the online poll. 3. Matt Cage (@proudcaucasian)-It’s been a little while since we’ve seen his name in the Top 10, but he’s sitting in the #3 spot in the IPR 100 right now for a reason. He wins more often than not, quite frankly. This past weekend he defeated Jimmy Jacobs at AAW on 9/12 and then retained his DREAMWAVE Title in a dream “Cage vs. Cage Match” vs. Brian Cage on 9/13. It was one hell of a weekend for unquestionably one of the best in the Midwest. There’s very little that “Money” hasn’t accomplished so far in 2014. 4. 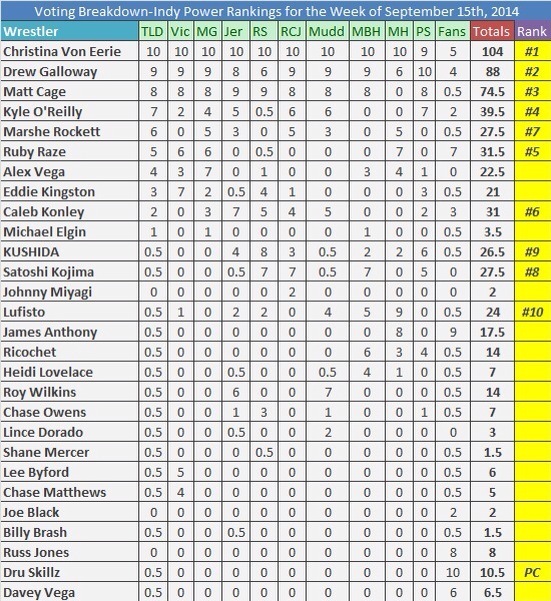 Kyle O’Reilly (@ROHOReilly)-After a subpar start to the year in terms of wins and losses (and subsequently a lack of rankings) he’s starting to get on a roll now. He is 5-0 the last 3 weeks after defeating Adam Thornstowe at QPW on 9/13. The PWG World Champion and ½ of the ROH World Tag Team Champions is really starting to make his mark and in doing so, he’s steadily climbing that IPR 100 ladder. With just a few months left, we’ll see what kind of progress he can make in singles before the end of the year. Tied for #9 in the online poll. 5. Ruby Raze (@Razerpops)-On 9/12, she made Luna Vachon proud when she won the Luna Vachon Cup at Vendetta Pro. It was an impressive performance as she defeated Kikyo Nakamaura, Sage Sin Supreme, Laura Palmer, and Andrea the Giant in a Rumble Gauntlet to be crowned the winner of the cup. This is surprisingly her first ranking, but not surprisingly it’s a very good one as she has been doing a fantastic job making a name for herself on the West Coast. Now that she’s got some momentum and a ranking on her side, it will be interesting to see what she can accomplish the rest of the way in 2014. #4 in the online poll with 49 votes. 6. Caleb Konley (@calebkonley)-Here’s another name that has been notably absent for the last several months after dominating the early part of 2014. At EVOLVE over the weekend, he had one of the better showings as he defeated Ricochet clean in the middle of the ring on 9/13 and then followed that up by winning the DGUSA Open the United Gate Tag Team Titles with Anthony Nese from the Bravado Brothers in a 3 Way also involving Rich Swann & AR Fox on 9/14. It was the type of weekend that got Konley right back on the IPR radar and it’s most definitely something to build on for the former PWX & WrestleForce Champion. #8 in the online poll. 7. Marshe Rockett (@m80mrockett)-While his name has not popped up in the Top 10 nearly as much as it did in 2013, his weekend was inarguably as “good as gold.” On 9/13 he outlasted a slew of other talented competitors in the DREAMWAVE Good As Gold Rumble and came out on top. That HUGE win not only earned him a spot in the Top 10, but a future shot at the DREAMWAVE Title currently held by our #3 Matt Cage. This is definitely a “money” matchup in the future and we are looking forward to it all going down. 8. Satoshi Kojima (@cozy_lariat)-While Kojima and Marshe Rockett were actually tied, it was the fan vote that separated the two of them as Kojima did not get any fan support, despite a 5-0 weekend at New Japan. With so much talent on the poll, it happens from time to time to even some of the best in the world. One thing that kept him from an even higher ranking this week was that all 5 wins were in some form of tag team matches. After getting a #1 ranking earlier this year, this is his chance to move up the IPR 100 if he can build on this. 9. KUSHIDA (@KUSHIDA_CANADA)-Much like Kojima before him, this NJPW star didn’t get a lot of fan support this week BUT the official voters gave him enough votes to get him into the Top 10 once again this week. 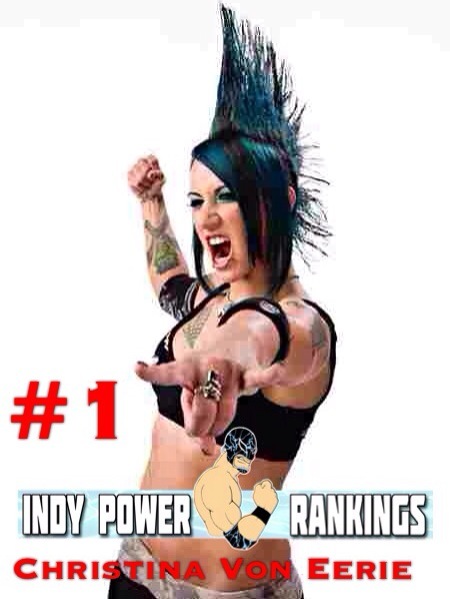 Also like Kojima, he’s a former #1 in the Indy Power Rankings and this ranking will help his stock in the IPR 100 at the end of the year. With two major titles to his credit (IWGP Junior Heavyweight and IWGP Junior Tag Team) he’s going to have many more chances to get ranked this year. 10. LuFisto (@LuFisto)-The WSU Champion gets in this week on the strength of her impressive title defense vs. Allysin Kay on 9/13. This is long overdue as LuFisto has been absolutely tearing it up this year all across North America. While the fans didn’t necessarily give her a lot of support this week due to the litany of talent that was on the poll this week, again the official voters gave her a lot of credit for her recent body of work. We look forward to seeing her name more and more throughout 2014. People’s Champ. 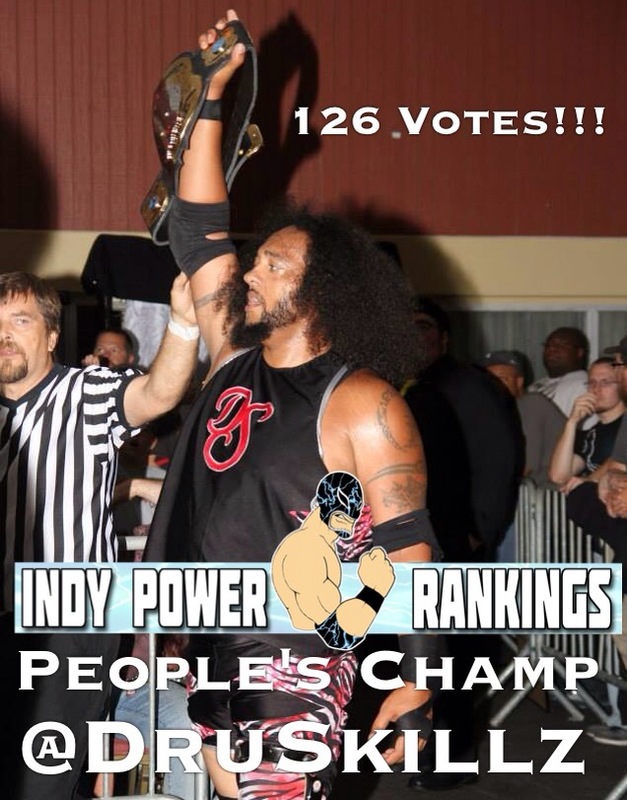 Dru Skillz (@DruSkillz)-He was a late addition to the poll, but his fans made the most of it as they came from WAY behind to pass James Anthony for the #1 spot in the poll and The People’s Champ award this week with 126 votes this week after defeating Carlito at Heroes and Legends on 9/13. Big week for ½ of the Soul Shooters. ← Who should be #1 in the Tag Team Top 5 for the Week of 9/15/14?